‘Tis the season of giving…and receiving. As a Primoris Wine Club Member, get an additional 5 percent off all purchases through December 31. Let’s celebrate! Join Ledger David Cellars for our Holiday Wine Club Pick Up Dec. 5-7 at Le Petit Tasting Room. Celebrate special wine releases including our limited production 2011 Syrah, named one of Oregon’s ’50 Best Wines’ by Portland Monthly Magazine. Other exciting holiday releases include our 2013 Chardonnay and our 2012 Cabernet Franc. It’s your time. Indulge in your wine paired with a decadent spread of sweet and savory seasonal items. Also, enjoy live music from harpist Mary Vannice on Fri. Dec. 5 and jazz artist Ed Dunsavage on Sat., Dec. 6 from 2-4pm. BILLING INFO: Please let us know if your billing information has changed. Call Heather Davis at (541) 664-2218 or email heather@ledgerdavid.com and she would be delighted to update your payment information before processing your wine club order. WINE CLUB DISCOUNTS: We will be processing orders on Tuesday, December 2. As a reminder, 3-bottle members receive a 20% discount, 6-bottle members receive a 25% discount and 12-bottle members receive a 30% discount on all wine selections through December 31, 2014. OTHER PICK UP OPTIONS: If you are unable to join us during this event weekend, your wine club selections will be available after Monday, December 8 at the tasting room in Central Point (next to the Rogue Creamery) any time during regular hours. Date: 1929 Location: Barcelona, Spain. Event: 1929 World’s Fair Wine Competition. Moment: Spain’s Vega Sicilia is discovered by at-the-time a worldwide audience of wine lovers as its 1917 and 1918 vintages win multiple awards. Fast-forward to 1956 as Vega Sicilia initiates the formation and organization of Spain’s Ribera del Duero wine region as a Designated Region of Origin, similar to our own AVAs. Next, in 1986 and in a world far more connected and wine savvy than in 1956, a wine review was published that would prophet change in the wine world. Robert Parker’s Wine Advocate rated the 1982 Pesquera very highly and the fruits of Winemaker Alejandro Fernandez’ labor ignited fires the world over as growers, producers, and consumers suddenly “discovered” the Tempranillo-based red wines of the Ribera del Duero once again. While long the backbone for the great and profound wines from Spain’s Ribera del Duero and Rioja it wouldn’t take long for Tempranillo to become the world’s 6th most widely planted grape. There is considerably more Tempranillo in the US than one would think, but it has mostly been relegated to plantings in California’s Central Valley and used in the production of generic, bland, non-varietal wines of little distinction. However, in the mid-90s several individuals in the US who realized the potential of Tempranillo began trying to elevate the status of this noble grape. A precious few plantings found their way to premium sites and soils in California’s Sonoma and Napa counties and Sierra Foothills, as well as Oregon’s Umpqua Valley. In 2002 a group of Tempranillo producers met at an invitation-only varietal tasting hosted by journalists Ray and Eleanor Heald. People met, wines were tasted, and discussion ensued as the seed for an organization dedicated to promoting Tempranillo grapes and wine grown and produced in the US was planted that day. Next, in January 2004 those people got together again, along with a few other pioneers, and formed the base of the group that would promote the Tempranillo banner, TAPAS, or Tempranillo Advocates, Producers, and Amigos Society. From that initial meeting of fewer than a dozen people TAPAS has grown into an organization with nearly 70 winery members. TAPAS biggest annual event comes in the form of International Tempranillo Day the second Thursday in November each year. Jump forward to today. We already knew the Ledger David estate vineyard was perfectly suited to producing luxurious Tempranillo fruit when our vines went in the ground in 2008. In 2010 we had planned to remove the fruit from those young vines, but we were persuaded to leave it on the vine and that gorgeous wine could be made from that young fruit. The results speak for themselves. Our 2010 Tempranillo, 2010 Tempranillo Reserve, and 2010 Tempranillo Port have been some of our most popular, as well as awarded, wines. Come Celebrate International Tempranillo Day at Ledger David on Sat., Nov. 15 from noon-5pm. Enjoy small bites paired with our first vintage 2010 Tempranillo Reserve and our very limited Tempranillo Port along with a selection of other estate wines. For more information, visit www.ledgerdavid.com or call (541) 664-2218. Well here I sit, Macbook on lap, trying to find the words to express the vintage we are experiencing in 2014 at Ledger David Cellars. Yes, I know the hype in Oregon this year has been early, hot, bountiful, and great quality. I’ll go along with all but the first. You remember my recent post about how our vineyard is a cool spot in a warm area? The evidence is at hand. Let’s dive into our white harvest so far. 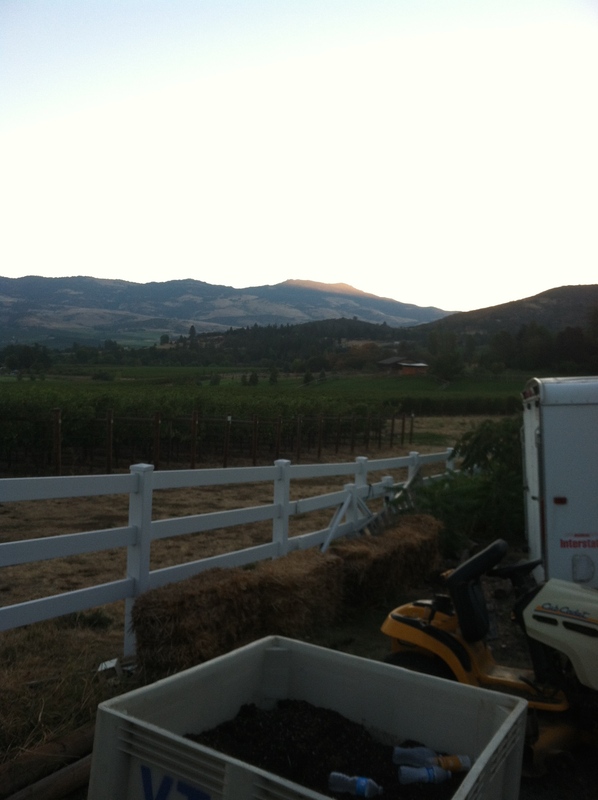 Ledger David vineyard in Talent at sunrise during Harvest 2014. The Ledger David whites are all in the barn (I’m from the South, remember? Everyone has a barn in the South and that’s where crops go when harvested). Our first pick, Sauvignon blanc, or savvy as one of my dear Aussie compadres calls it, is fermented dry and aging. Crisp, clean, concentrated aromas and flavors. Our second pick was Chardonnay. The Chard has completed its primary fermentation, as well. We kept our vineyard’s two clones separate this year and are again using roughly 20% new French oak and 30% ML fermentation. The wine right now is hard to read. It just finished the alcoholic fermentation and hasn’t fully integrated as of this morning. The component parts, intense tropical fruit, balanced acidity, toasty oak, caramel and butterscotch tones, are there, but they aren’t all playing the same page of music just yet. Patience required. Chenin blanc came in next. We turned the Chenin into a grand experiment. We have a great combination of stainless steel drums and neutral oak barrels and we have multiple yeast strains at work including “native” yeast, which are the yeasts that come into the winery on the fruit. We will bottle several different tiny lots of this wine for future tasting to see which of these trial wines comes closest to expressing our vineyard site when compared to prior vintages. I have to say the wines are beyond interesting with unctuous mouthfeels and textures unlike anything we have done in the past. Viognier was next. All I can “legally” share about our Viognier from 2014 is that it is simply astonishing, a first for Ledger David, and an exceedingly rare style of wine. Trust me when I say it will blow the status quo out of the water. Lastly, we harvested our Malvasia bianca. Malvasia is a very late ripening variety and the wine has only just begun to ferment. We have a little something special planned for this, too. Fresh reds from the 2014 Harvest show signs of future award-winning wines. Our first red in the barn was Syrah. As I tasted the three bins of fermenting black marbles this morning I was struck first by the intense inky color. Then the aromas took my nose for a ride. Blue and black berries, earth, game, road tar, pepper, all-spice, grilled bread, and an intriguing herbal note that reminded me of dried herbs de provence and garrigue. Tempranillo came next, or at least part of it. What we have fermenting right now astounds me with its depth of flavor, richness of texture, and structure considering its age. This earlier-ripening clone tasted in the vineyard like it had something special to show, which is becoming a bit more obvious now. Reserve, you ask? I can’t say for certain just yet, but am definitely leaning that way. All of our Malbec came next. Wonder why my hands are stained? Wonder no more. Malbec inspired the “Society of the Black Hand”, of which I am a proud member every harvest. It stained the inside of the glass as I swirled and is staining my keyboard now. Intense black and red fruit, lavender, and freshly roasted coffee with an oily, thick, chewy, and extracted texture, mouth-filling body, and long, pure finish. All I could say was, “Wow.” We have harvested a portion of our Sangiovese and Cabernet franc, but those wines have not begun to ferment yet. Given the Syrah, Tempranillo, and Malbec thus far I am seeing this as one of those rare vintages in which Mother Nature blesses our vineyard with exceptional fruit and we do our best to coax from those grapes an expression of her goodness, vitality, and indomitable spirit. It won’t be long before we start thinking about pressing the reds off the skins, selecting and filling barrels, and shortly after that blending. The process comes on fast, but with wines like these it is such happy torture. The last of the wines were picked the first week in November – Cabernet franc and Petit verdot. Introductory Notes: This particular recipe for a delightful seasonal soup features pumpkin but lots of hearty fall vegetables can be used as the base. Also, scallops are just one possible seafood selection. Crab, lobster, rockfish, the choices are nearly endless. I like crumbled smokey blue cheese from the Rogue Creamery for one but bacon crumbles, grated parmesan, any number of chopped nuts and a whole host of garnishes (chives, parsleys and other tasty greens) all work beautifully in this fall delight. I encourage you to experiment and have fun eating healthy and seasonally! 2 lbs. Pumpkin: You can chop up your market pumpkin, grow your own or in the case of me putting this recipe together, use canned. Whip the cream ahead of time and set in the refrigerator until serving time. In a large heavy bottomed sauce pan melt the butter over medium heat. Add the garlic, onion until lightly caramelized. Add the pumpkin, honey, chicken stock, white wine and simmer for 10-15 minutes. Remove from heat and let cool for 10 minutes. Puree this in a blender or food processor. Return to the saucepan and reheat. In a large skillet, heat the olive oil and pan sear the scallops until lightly golden brown on each side. Watch carefully and don’t overcook the scallops. Fill each bowl with the pumpkin soup and place equal number of scallops in each bowl. Dollop the whipped cream and lightly dust with cinnamon and nutmeg. Garnish with the chives, parsley and nuts. The 2014 award season was been very kind to Ledger David Cellars, but how does one recap a season in which we entered only a few wine competitions and had stars emerge in each one? There are literally hundreds of competitions held annually throughout the country. Some producers like to tout 25 medals for an individual wine. Our philosophy on competitions is somewhat different. We could enter 30 or more wine competitions per year, but we prefer to enter only a few highly competitive and invitation-only contests so that our medals carry a bit more weight. In our eight competitions in 2014 we earned 17 medals. There isn’t room to mention each one individually, and that limitation always draws some less-than-kind glares from the wines not mentioned, so be kind to those wines when you visit Le Petit Tasting Room, but we can cover the major highlights. First up, our 2011 Cabernet franc. By no means are producers of Cabernet franc in the Pacific Northwest few in number. In reality, we’re one of probably several hundred PNW producers when you consider Washington, Idaho, British Columbia, and Oregon. When we got the invitation from SIP Northwest to be considered in a “Best of the Best” competition we were flattered. When we got the news we won we were ecstatic. Look. The Cab franc is beaming, too. Second in line is the 2011 Syrah. Syrah is a great match for the Ledger David Cellars estate vineyard. During the growing season Syrah obviously enjoys our east-facing slopes as it develops and ripens. We really enjoy the wine it produces, as well. 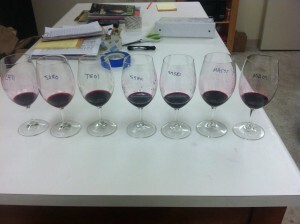 The judges for Portland Monthly’s annual “Oregon’s 50 Best Wines” agreed. We ranked #35 in their tasting. There are easily 1,000 wines produced in Oregon in any given year. This distinction is both huge and humbling. 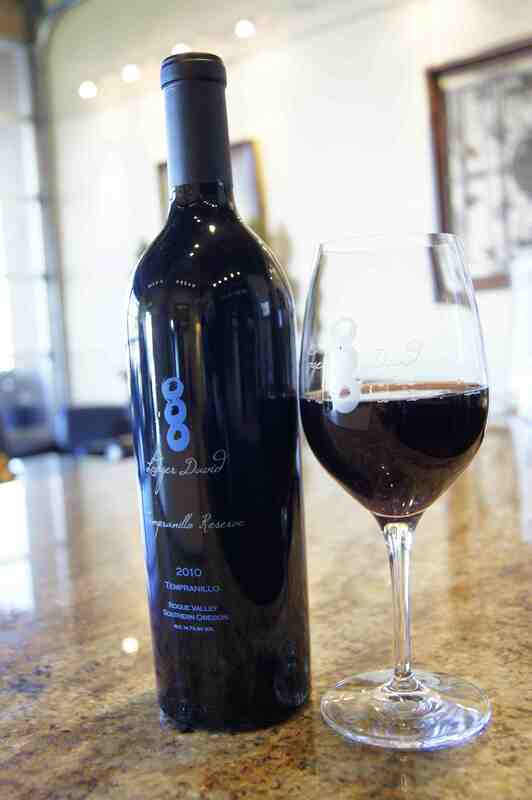 Last, but certainly not least, our 2011 Malbec. This is the first Malbec for Ledger David Cellars. We have always held Malbec in high regard and our site has produced some pretty good Malbec fruit, but we had to be certain we measured up before we took the plunge to bottle a varietal Malbec. When the wine was shipped to the 2014 Los Angeles International Wine Competition we had no expectations. A few weeks later we got the news: Gold Medal, 93 points, and the second highest rated domestic Malbec. Yep, quite a year! With all of these things in mind and the end of our harvest season approaching we thought a little tribute to these wines to finish off the year would be fun so we are planning a “Best of the Best” weekend for Sat., Nov. 22 and Sun., Nov. 23. A $10 tasting fee will apply and we’ll have our three award winners available in their remaining limited quantities paired with small bites from Déjà Vu Bistro & Wine Bar in Jacksonville. Think we should make this an annual event? Peel potatoes and drop into a bowl of cold water and preheat oven to 300 degrees. Combine the cream, milk and hot sauce into a measuring cup. Saute shallots and garlic in 1 tsp. butter and cut the remaining butter into small cubes. When the shallots and garlic are soft, add the Ledger David Primoris and cook for 5 minutes, then set aside. When cool, add to the cream/milk mixture. Butter a shallow 10” baking dish. Slice potatoes into 1/8” rounds and place in the dish to cover the bottom. When you have a layer of potatoes, sprinkle with 1 tsp of salt, ½ tsp pepper, 1/3 of the Greyure cheese, and 1/3 of the butter cubes. Begin a second layer, following the same procedure. For the third and final layer, top with the cheese, sprinkle with salt and pour the cream/milk mixture over the potatoes. Bake potatoes for 1 ½ to 2 hours, uncovered, until you can insert a knife into the potato slices with no resistance.